PierceCare provides opportunities for a wide range of spiritual, cultural, educational and recreational pursuits. Opportunities include a multi-purpose room for community gatherings, living room, coffee nook, billiards room, exercise room, walking paths, bank, computer station, card and game rooms, gardening area with raised garden beds, library, chapel, country store and beauty shop. We also provide regularly scheduled transportation to a wide variety of popular area activities. What kinds of fees do independent living residents pay? 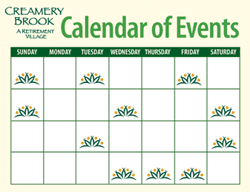 Independent and assisted living apartments at Creamery Brook Village are available on a rental basis with no significant upfront investment. Simply move-in to a one or two-bedroom apartment of your choice with a simple one-year lease. There is also a rental program available with no entrance fee. The Residence and Services Agreement offers lifetime residency of the cottage of your choice as well as the security and peace of mind knowing you have guaranteed access to the on-site continuum of services and care at Pierce Memorial Baptist Nursing and Rehab Center. Residents pay a monthly fee to cover the cost of services. What is included in the independent living monthly service fee? Is the monthly rental fee fixed, or is it subject to change? The monthly service fee is subject to change. It is reviewed annually by the Board of Trustees and management and may be adjusted based on the community’s actual operating costs. PierceCare strives to maintain its costs at the lowest feasible level consistent with sound financial practices. We notify residents of any increase in the monthly service fee at least 30 days in advance. 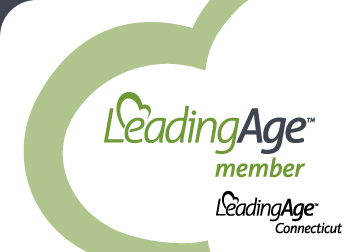 Are any additional services available in independent living? What health care services are available to residents? Our on-site health services include traditional assisted living, skilled nursing care (rehabilitation), and long term care. Long and short term health care is paid for on a “fee-for-service” basis. You only pay for those services you use, when you use them. Pierce Memorial Baptist Nursing and Rehab Center has consistently been recognized by the Connecticut State Department of Health and Centers for Medicare and Medicaid Services for outstanding care. Traditional Assisted Living: PierceCare – Creamery Brook Village’s assisted living lifestyles provide residents with the help they need with their activities of daily living in a comfortable, residential environment. It is designed to maintain a resident’s optimal level of independence and autonomy when a resident’s condition is determined by their physician to be chronic and stable. Nursing Care: PierceCare – Pierce Memorial Baptist Nursing and Rehab Center operates a licensed nursing care program, where qualified, licensed and certified professionals provide 24-hour care. What should I look for when choosing an assisted living residence? In assisted living, seniors maintain control and independence while receiving assistance with daily activities such as bathing and dressing. Around-the-clock nursing staff is usually not available. Ask for a tour and visit the center during off hours. Sample food, check out the activities schedule, visit with residents and ask about talking to family members.. Most locations require private payment, so ask about cost and consider whether this works with your financial situation. How do I become a resident of Creamery Brook Village? Schedule a personal visit with one of our knowledgeable marketing counselors to learn more about the benefits and value of retirement living at PierceCare. Select the apartment or cottage home that best suits your preferences, and make a reservation deposit to hold your residence until move-in. Complete and submit your application forms. Personalize your apartment, or cottage home. More than ever, people are recognizing the importance of planning ahead for their retirement and future health care needs. Call one of our marketing representatives at (860)-779-8700 or contact us online to schedule a visit and begin to imagine the possibilities of your future at PierceCare. What can I expect living at PierceCare – Creamery Brook Village? Independent and Assisted lifestyles at Creamery Brook Village include such amenities as exercise room, library with computer access, dining with waited table service, coffee nook, Putnam Bank branch, and transportation. In addition, you have priority access to our on-site rehabilitation and nursing care, if and whenever you need it. Residents have the peace of mind of a 24-hour emergency response system and round-the-clock security. Assisted living residents have a nurse on-call 24-hours a day in case of an emergency, when services are provided by the Assisted Living Services Agency. Since it is your home, you come and go as you please within a secure community of friends. Creamery Brook Village gives you freedom from light housekeeping, lawn care, home maintenance and other chores, allowing you the time to enjoy the things that are most important to you such as visiting friends and family, travel, hobbies and more. You have added peace of mind knowing that assistance and healthcare are available, should you need them for as long as you need them. What are the costs at Creamery Brook Village? The monthly fee simplifies typical monthly expenses and includes all the high quality services and amenities offered here: real estate taxes, property insurance, utilities, local telephone, basic cable t.v., one meal daily, weekly housekeeping and linen service, interior and exterior grounds keeping maintenance, scheduled transportation, security, parking and round-the-clock emergency response. Of course. Pets are always welcome at Creamery Brook Village subject to the Pet Policy. Yes. Parking is available in lots adjacent to the apartments. The cottages have their own attached garages. Creamery Brook Village has additional, lockable indoor storage space for your seldom used possessions and/or seasonal items. One of the benefits of Creamery Brook Village is our extensive offering of educational and recreational activities. We offer a regular schedule of lectures, music, art, movies, entertainment, health and wellness programs, trips in our own bus, gardening, bridge groups, and many other programs. A few examples of the range of programs we offer are fitness programs, transportation to local churches, social hour, travelogues, Wii bowling and spiritual/religious services for all faiths. Creamery Brook Village has an exercise room, community meeting rooms, living room, coffee nook, library, billiards, Putnam Bank branch, beauty salon, and prescription delivery. Guests of any age are always welcome at Creamery Brook Village because it is your home. Your home at Creamery Brook Village is your personal space. You may entertain overnight guests in your apartment or cottage or, there may be a guest suite available at a reasonable cost. All guests must register with the front desk and follow community rules while on premise. Is there a place where my bridge group, book club or other group could meet? Creamery Brook Village has lounges for reading, socializing or throwing a private dinner party or gathering. Our Activities Director conducts many classes, activities and special interest groups which you may wish to join. In addition, your own group is welcome to meet at Creamery Brook Village in any of the available common areas. Pierce Memorial Baptist Nursing and Rehab Center at PierceCare has a medical director, lab services, visiting physicians, and a 24-hour licensed nurse on duty. If you have a minor illness, such as the flu, you can remain in your apartment or cottage. Tray service is available from one of our dining venues so that you can dine in your home. If a temporary stay or permanent transfer is needed in the health center for a more serious illness or recovery from surgery, will have priority access to our on-site nursing and rehabilitation center. Can I buy extra meals? 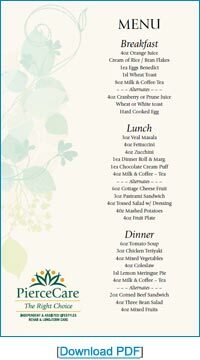 You can purchase additional meals for yourself or guests in the dining room. If only one meal per day is included, where do I get my other meals? Your cottage or apartment at Creamery Brook Village has a fully equipped kitchen so that you may prepare your own meals. You may also purchase additional meals in the dining room, order a sandwich of the day, or dine out in one of the many area restaurants. Should your plans change, just notify us in writing to have your reservation deposit returned. There is no risk since reservation deposits are refundable less the application fee. If I am interested in moving to PierceCare , but not ready to give up my home, when is the right time to move? When you are settled in a house you love, it is difficult to make a big move to a retirement community. However, your good health is your best assurance for entrance. If you wait until you need assistance, it may be too late to quality for residency. Making a Reservation Agreement well before you think you need to move is strongly recommended. Our Wait List option is for individuals who are planning for their future and would like to have a priority for their choice of residence.